Beloved Japanese manga character Doraemon might seem to be an unlikely source of serious controversy. But in India and Pakistan, the chubby blue robotic cat has become a target of bitter criticism from some politicians and social activists. They are campaigning to ban the popular character from television. 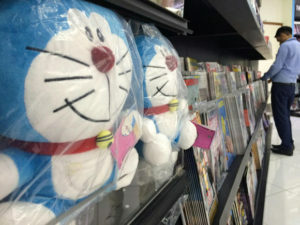 In late July, Ashish Chaturvedi, 29, a prominent social activist in central Madhya Pradesh state, sent a letter to various organizations in India urging a ban on the Doraemon anime series. The recipients of the letter included the central government, the state government, a self-censorship organization for entertainment programs, and two broadcasters airing the Doraemon series, including Disney India. The letter enumerates examples of bad influences the TV series is having on children in India. It claims, for instance, that many children have acquired some of the bad traits of one of the central characters, Nobita, a silly and unmotivated pre-teen boy. 1. In your own words, describe the main characters Nobita and Doraemon. – children emulating (imitating) Nobita have started refusing to do their homework and speaking to their parents and teachers impolitely. 3. Who should be held responsible for TV shows having bad influence on children?